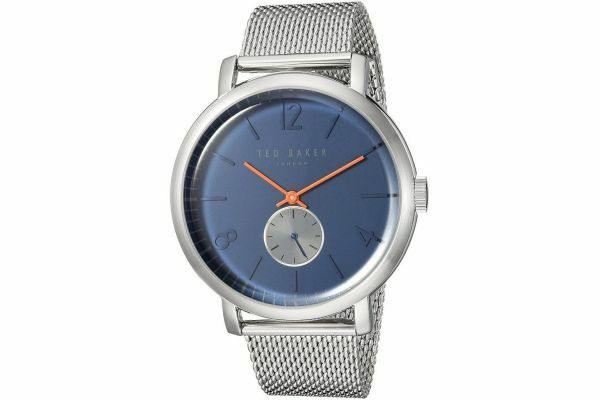 This bold men’s watch is brought to you by renowned fashion designer Ted Baker as part of their Oliver collection. Featuring an oversized 44mm stainless steel case and brushed stainless steel bezel, this stunning watch demonstrates an unusual curved glass giving a nautical feel to the timepiece. Alluring with its inky blue dial and contrasted by the dark orange batons and metallic silver seconds sub-dial; this watch oozes sophistication. Large blue hour markers and numbers are set at the 12, 4 and 8o’clock positions adding further flair to this striking watch. Set upon an elegant stainless steel mesh strap, the Oliver watch makes for the perfect casual and formal accessory. Powered by Quartz movement and protected by mineral glass, this watch is water resistant up to 50 meters. A hidden engraved lobster can be found on the reverse of the watch case, along with Ted Baker logos and quirky phrase ‘Ted’s never fashionably late’. 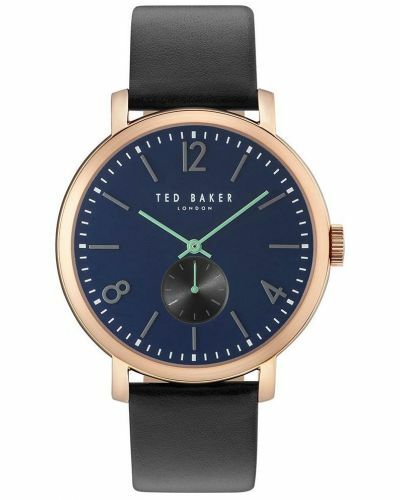 For us to size your new Ted Baker Oliver watch as accurately as possible, please take a look at our downloadable Watch Sizing Guide.